LAHORE: (Tuesday, March 20, 2018): Punjab Higher Education Commission Chairman Prof Dr Nizamuddin has said that economic development cannot take place without introducing decentralized system in decision process. He was addressing the inaugural session of two-day international conference on “Governance, Management & HR: Strategic Directions”. 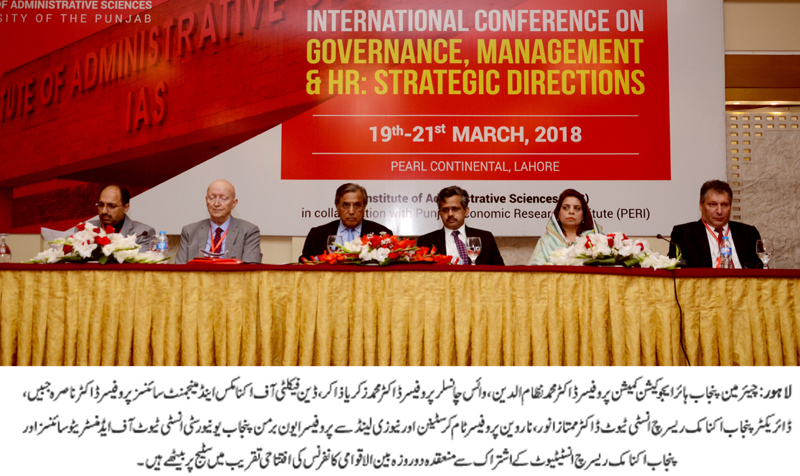 The conference was jointly organized by Punjab University Institute of Administrative Sciences (IAS) and Punjab Economic Research Institute (PERI) at Pearl Continental Hotel Crystal Hall here on Tuesday. PU Vice Chancellor Prof Dr Zakria Zakar, Dean Faculty of Economics and Management Sciences Prof Dr Nasira Jabeen, Punjab Economic Research Institute Director Dr Mumtaz Anwar, Prof Tom Christensen from University of Oslo, Norway, Prof. Evan Berman from Victoria University of Wellington, New Zealand, delegates from various parts of the world, faculty members and a large number of students were present on the occasion. Addressing the inaugural session, Prof Dr Nizamuddin said that research could contribute to improve governance and develop human resource and attention must be paid to such conferences for economic growth of Punjab. He said we must prepare comprehensive policies for the success of China Pakistan Economic Corridor, which was a game changer in the region. He said that Punjab Higher Education Commission and universities were playing important role for initiating debates on public policy. PU Vice Chancellor Prof Dr Zakria Zakar said that we need to promote innovative ideas and such conferences enhanced our international connectivity. He said governance was linked with human resource and it was need of the hour to focus on development of human resource for the progress of our country. He said that in the present era when the governments were facing governance, management and human resource issues both locally and internationally, leading to numerous reform initiatives for the improvement of public service delivery is indeed a step in the right direction to identify the strategic direction. He said that our youth were living in isolation and such conferences provide an opportunity for cross cultural understanding and exchange knowledge and experiences. He said that participation of academics from across the globe had provided a diverse pool of ideas. He said that the conference would provide some innovative ideas to improve functioning of our state and organizations. Prof Dr Nasira Jabeen said that the conference aimed at providing a venue for academic conversation and scholarly dialogue on the strategic directions that governance mechanisms in the public sector, management of organizations and human resource management practices take due to the peculiarities in the culture and context of countries in Asia and beyond, especially in light of the CPEC. She said that the conference aims at generating a discussion on CPEC, its socio-economic impact and challenges it posed to the governance, management and HR practices in Pakistan. Dr Mumtaz Anwar said that the theme of this conference focused on human resource and the management structure. He said that in recent times, the public sector had shown advancements with regards to identifying and nurturing efficient workforce. He said that investing in human resource is central to governance and management. In the session, Prof Christensen delivered lecture on “comparative university governance reforms- perspectives and experiences” while Prof Berman delivered lecture on “innovations in public sector reforms in Asia: implications for HR” and shared their thoughts on improving governance and developing human resource. A total of 72 research papers have been selected out of 200 abstracts received for presentation at the conference. The conference will be continued today.